The JV Girls’ Basketball team lost 18-53 against Kent on Feb. 9. Through a combination of effective half-court zone defense, taking advantage of transition baskets early on in the game, and good ball movement in the half court offense, the Wyverns built an early lead and added to it gradually throughout the game. Caroline Dawson '22, Emma Henry '21, and Keegan McMahon '21 contributed through key rebounds at both ends and effective passing on offense. Catherine Daniels '21 and Cici Chagon '21 shared team scoring honors for the game. The JV Boys’ Basketball team won 39-37 against Kent on Feb. 9. KO played a great game versus a scrappy Kent team on the road. KO was down one point with under a minute to play when Jeff Davis ’21 made a three-pointer from the right wing with eight seconds left to give KO a two-point lead and hold off the last shot by Kent to end the game. John Doar ’20 and Jeff Davis led the scoring with 12 and 10 points. Christian Pedro ’22 and Wes Pierce ’20 contributed seven and four points as well. KO as a team played great defense and rebounded well. The MS Girls’ A Basketball team beat Hopkins 36-24 on Feb. 13. The game was marked by great defense, as both teams prevented the other offense from clicking for long stretches. KO fought through Hopkins’s tight defense with smart passes that gave the Wyverns high-percentage shots. On the offensive end, Emily Knowles ’25 led the team with 14 points, many of which came off of quick drives to the basket. Jordan DiMauro ’23 followed with 12 points, and Quinn Kearney ’23 scored six. Kearney also grabbed many important rebounds, which prevented Hopkins from getting many second-chance shots. Though kept off of the board on offense, Kyra Dunnirvine ’23 had a strong defensive performance, working hard to keep Hopkins's scorers from getting the ball. This was vital, as a talented Hopkins team was not able to make any kind of comeback once KO got an early lead. Along with Kyra, everyone played tenacious defense, especially when pressing Hopkins to start the game. This was a very positive performance for KO as the team continues to work hard and find success. The MS Boys' A Basketball team honored their Form 2 players on Feb. 13 while playing Solomon Schechter. Aarya Dalal ‘23, Jaden Hinderlie ‘23, Jacob Joseph ‘23, Mitch Legeyt ‘23, Brady Nichols ‘23, Andrés Rollán ‘23, Cooper Schumacher ‘23, and Devin Wolff ‘23. An even matchup, the Wyverns held back the Scorpions and won the game with a final score of 60-51. While the Scorpions led the scoreboard in the first half, the Wyverns stepped up their tenacity in the second half with more inside shots and a very high percentage of foul shots. The last five minutes of the game proved to be the most suspenseful. The Scorpions caught up to be led by only three points, but the Wyverns remained in control of the game and finished strong by a lead of nine points. Outstanding performances were had by several players including Devin Wolff ‘23 with 24 points and Jack Decker ‘24 with 18 points. The Varsity Girls’ Swimming and Diving team swam some of their best races yet against a strong Westminster team on Feb. 6. Notable performances include four personal best times by Cai Kuivila ‘20, 1:23.52 in a fourth-place finish in the 100 Backstroke. Ahana Nagarkatti ‘21 led the pack with a second place finish in the 200 Free (2:14.42) and a first-place finish in the 100 Backstroke (1:08.25). Risha Ranjan ‘21 also swam a season’s best time in the 200 IM (2:40.56) and the 500 Free (6:14.13), earning first place on the latter swim. Stella Risinger ‘22 earned first place in the 100 Butterfly with a season’s best time of 1:08.93, while Captain Esha Shrivastav ‘20 earned all personal best times in her events, including the 200 Free (2:35.84) and the 100 Free (1:08.11). Finally, all in their first year on the varsity program, Serafina Squatrito ‘22 earned fifth best with a season’s best time in the 100 Free (1:08.25), Lily Liu ‘22 took fourth place with a best time in the 100 Breastroke (1:34.59), Maggie Dwyer ‘23 took second place in the 200 IM (2:34.87) and the 100 Backstroke (1:08.25) and Sarah Cioffi ‘23 took second place in the 50 Free (28.67) and 100 Free (1:05.00). We look forward to two more close competitions against Marianapolis this upcoming Saturday and Kent next Wednesday, at which point we will then begin to taper for our championship season! The JV Girls’ Squash team lost 1-6 against Miss Porter’s on Feb. 9. The team had to step it up once again to account for some absences and knew this would be a tough match from the start. The players made a point of focusing on personal development and staying in every point until the end. Aimee Zheng '22 pulled off a nice 3-0 win in the number one spot by hitting impressive deep cross-courts that left her opponent stuck in the back corners. Co-captains Sophia Kaufman '20 and Anusha Memon '20 set a great example for their teammates by analyzing the struggles they were having in their matches to produce an effective game plan and develop their gameplay with each game. The Varsity Girls’ Squash team won 5-2 against Loomis Chaffee on Feb. 11. The team hadn't played Loomis since the nail-biter 4-3 loss in the WALKS playday before the regular season started, so this match felt like a way for them to show how they have improved over the course of the season. Co-captains Ananya Alleyne '19 and Cami Berckemeyer '19 were ready to bounce back from some close losses last week, and they took it to their opponents with aggressive shots and intense effort, each saving at least a game in extra points to win the match 3-1 in the number two and three spots. Sloan Duvall '21 used precise deep shots to take control of the court and win her match with a 3-0 clean sweep in the number seven spot. This was a great display of progress for each individual player and overall for the team as a whole. The JV Girls’ Squash team lost 2-5 against Loomis on Feb. 11. 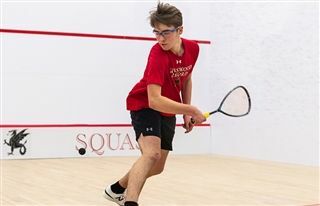 The team was finally back to their full lineup, and the Wyverns had an intense match against Loomis that demonstrated the team's grit. Macy Isenberg '22 saved two games that went into extra points to take her match 3-0 in an impressive display of mental endurance each game in the number seven spot. Mackenzie Caruso '22 showcased her work on her drop shots, using them to move her opponent around the court and win 3-1 in the number six spot. Aliza Sadiq '22 dug in to win 3-1 in the number eight spot, displaying her deep crosscourt shots that made the difference. Esha Kataria '20 continued her streak of hard-fought, five-game matches in a contest that was a few points from going either way. The Varsity Girls’ Squash team lost 3-4 to Berkshire on Feb. 6. The match was a close nail-biter, with players learning how to adjust to a new court environment to pull off competitive individual matches. Co-captain Ananya Alleyne '19 made an impressive comeback with a clever adjustment of the power of the shots, taking her opponent into five games in the number two spot. Claudia Petrie '19 battled through sickness and paced herself to win her match in five games in the number five spot. Amelia Levine '20 used her powerful straight drives to keep her opponent moving and won her match 3-0 in the number six spot. The Varsity Girls’ Squash team lost 3-4 against Miss Porter’s on Feb. 7. This was their closest match of the season so far. The Wyverns had some definitive individual wins and some struggles that could have gone either way. Co-captain Cami Berckemeyer '19 and Izzy Berckemeyer '21 had back to back 3-0 wins in the number three and four spots, respectively. Claudia Petrie '19 held onto an early lead to win her match 3-2 in the number five spot. Mai Lin Pomp-Shine '20 used well placed, low kill shots to win 3-1 in the number eight spot.